MSV: Councilman Mike DeFusco: "Can Hoboken be fooled?" Councilman Mike DeFusco: "Can Hoboken be fooled?" In June, Mayor Ravi Bhalla was censured by the NJ State Supreme Court for "unethical conduct" for failing to pay into his employee’s retirement account and being "nonchalant" about rectifying it for five years. That’s not just wrong, it’s heartless. To give some perspective on just how serious the Supreme Court decision is, Ravi was just one vote away from having his law license revoked. 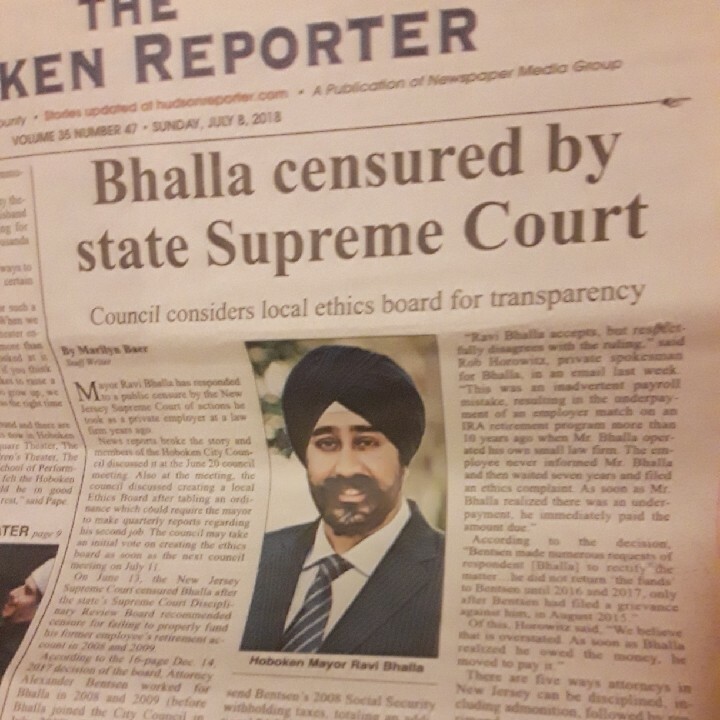 This comes on the heels of another scandal Mayor Bhalla caused when he broke a campaign promise and took a second job at a politically connected law firm. To distract from the mounting controversy, this week a close friend of the mayor’s Chief of Staff was sent to file a bogus ethics complaint against me. Their baseless allegation is that I am somehow benefiting a campaign donor by authoring an ordinance that helps homeowners affected by the city's oppressive flood ordinance, access their backyards without arduous municipal bureaucracy. This is something that the Zoning Board has urged the City Council to consider every year since 2012, and after half a decade of recommendations, it was approved by an overwhelming 7-2 vote. Perhaps most telling, after concocting the story, Mayor Bhalla sent out a fake version of a news article to his supporters that intentionally removed crucial facts, such as editing the headline to change the meaning and mislead residents. In a truly Trump-like move, he’s trying to manipulate the local media to fit his own twisted and false narrative. Over the past two weeks, I have had the chance to listen to more community feedback on this issue and I plan to re-introduce revised legislation next month with additional assurances that limit this to the smaller, family-friendly, homes most negatively impacted by the city's flood ordinance. Much like the original ordinance, the revised will continue to maintain the 30 percent rear yard standard currently required, ensuring green space, light and air is preserved for all residents, while still allowing them to access their backyards. This is an opportunity to make a small but important change to the way our city treats homeowners, and I’m not backing down from it. P.S. Should you ever need anything, please email me at Mike4Hoboken@yahoo.com or call me at 646.372.4341.